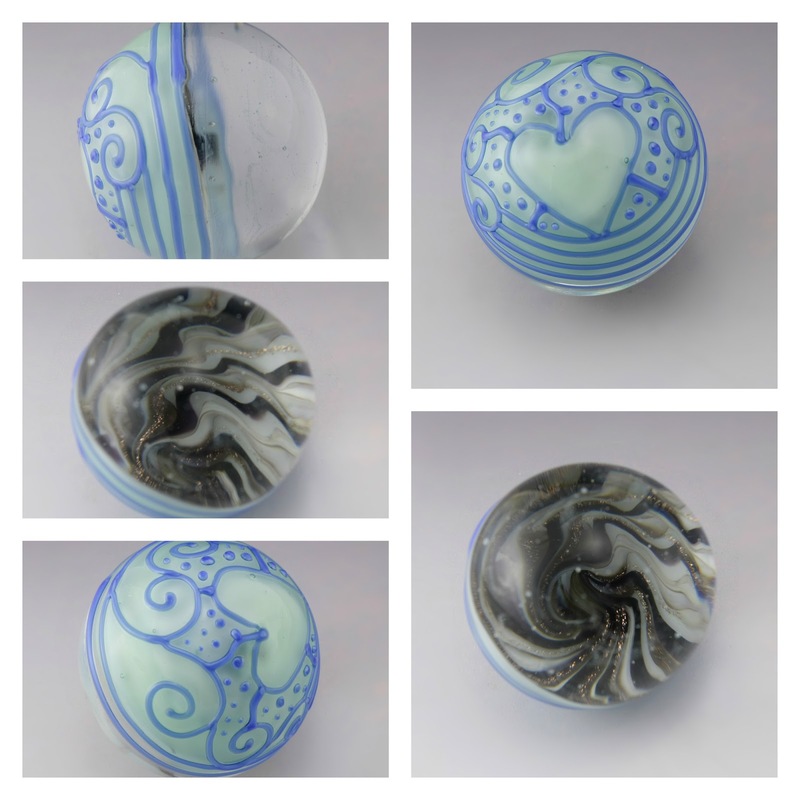 So in my last entry I mentioned that I've been playing around with marbles. Since then, I've made quite a few more and I'm feeling more confident in my off mandrel work. 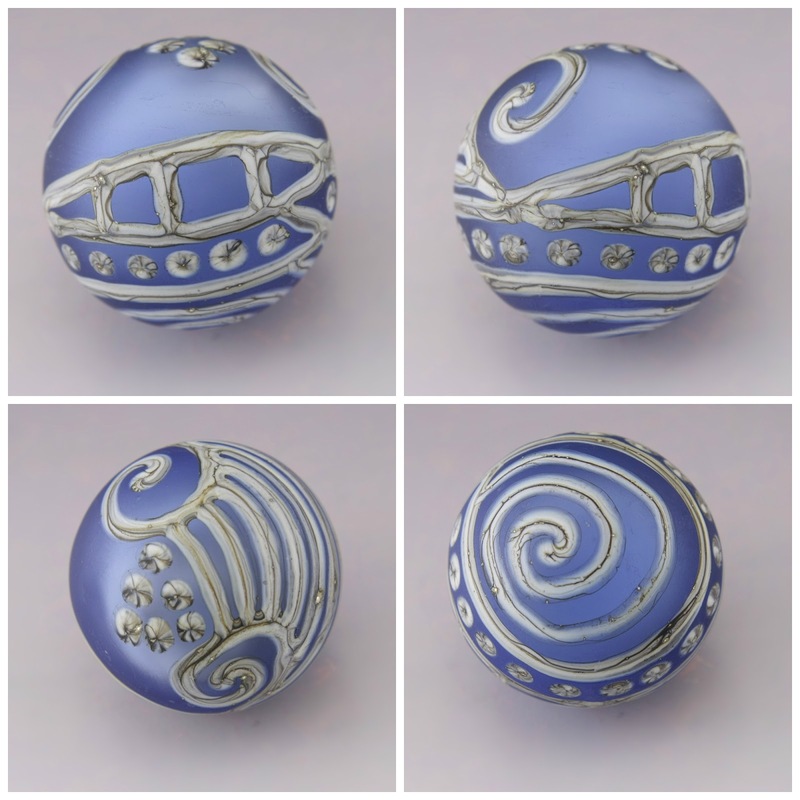 Here is some transparent blue over a core of white with silvered ivory linework. I've etched this to give it a glowing seaglass kind of look. I really love this glowing effect. This one was my first marble with a new larger marble mold. I think I might have gotten a little excited about the large canvas to work with and I completely covered it with lines. 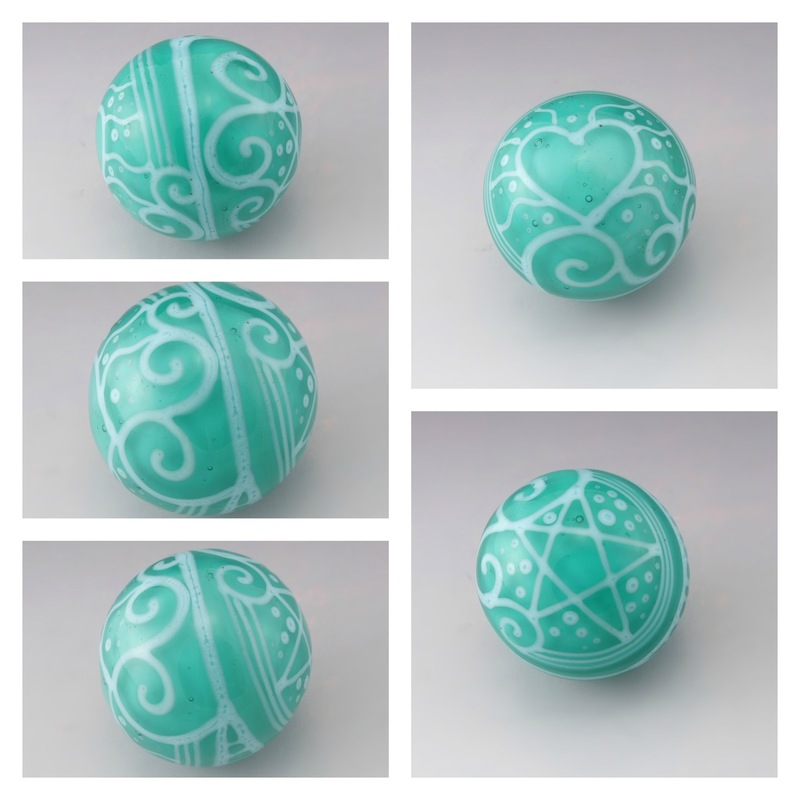 Transparent teal encased around a white core with sky blue linework. I really love the linework in this one. One side has a heart and the other a star. It feels like happy sidewalk chalk from childhood. Here is my most recent one from the weekend. It's the largest one I've mad so far at 27mm. I tried combining some traditional boro styles of marbles with my stringer work. So, one side is a vortex, while the backing has been embellished with stringer that I left slightly raised. This vortex style feels like a slight turning point for me because of the clear. 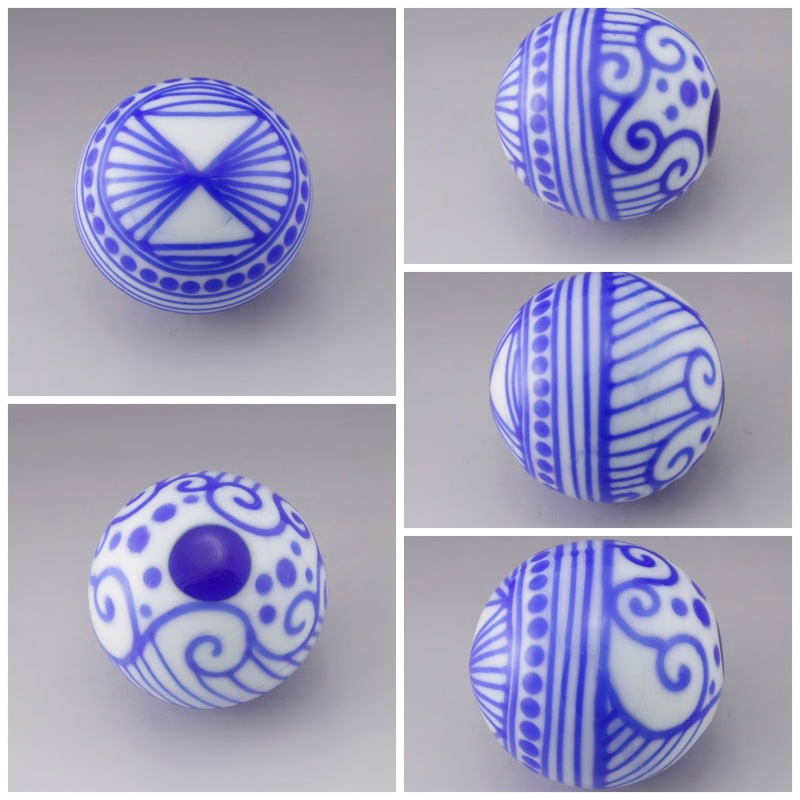 The marbles that I haven't been showing or selling aren't quite meeting my standards because of the clarity of the clear glass. Most people who work with effetre know that the clear often has quite a few bubbles and scratches in it. When dirt and oil get caught in these scratches on the glass rod, it turns into "scum" on the finished glass product. There's nothing physically wrong with it, but when you are trying to create a clear lens to showcase and magnify, that scum and bubbles can be distracting. The marble above has been made with larger diameter clear rods that I've cleaned very well using pickle. Pickle is a very mild acid that metal workers often use to clean the metal before soldering. The larger diameter clear also helps because less surface area of the glass rod is exposed to the elements. I'm still working on finding the best clear for me to make marbles with. Next up to try is large diameter rods of the newly formulated super clear. After that, probably double helix Zephyr. Submitted by Anoe on Tue, 07/24/2018 - 2:19am. Submitted by Alent1967 on Thu, 08/02/2018 - 4:16am. Submitted by Anna J. Porter on Tue, 10/16/2018 - 2:20pm. I am very inspired because this is very nice and interactive portal for events. Daily I visited this and today I got the information essay-to-go.net 48th Annual Oktoberfest celebration is going to start and I will enjoy beer with my friends. Submitted by andrew on Thu, 10/18/2018 - 3:03am.